Americans like having green lawns and lush landscaping around their homes. This design usually incorporates some type of grass like Bermuda, Fescue, Bent grass or Zoysia just to name a few. These environments need food and water to keep them healthy and looking good. These same requirements are what lure many types of pests in and around the home. Though most may only nest or traverse through the grass, some actually eat grass. Surface feeders like locusts, grasshoppers and katydids are easy to see so activity can be quickly identified and properly handled. However, pests which reside and live under the grass pose a whole other problem. One such pest actually eats the roots of grass and the unwary homeowner won't know it is active or present until their grass starts to die! This pest is quite common and can appear anywhere in the United States. This pest is the common GRUB !!! Grubs are the larval stage of beetles. There are many types of grubs but the ones which live in the dirt under grass are most likely Japanese Beetle, June Beetle, May Beetle, Black Turfgrass, Asiatic Garden or some other regional beetle which lays eggs whose larva feed on plants. Most people know what grubs look like. They usually have an off white, tan or even brown head, tend to be curled in a "C" position all the time, have lots of legs and a segmented body which is quite white. 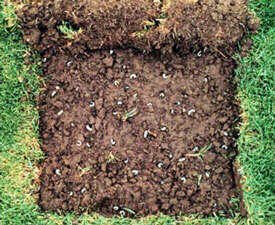 Grubs can vary greatly in size which is not only dependent on species. Clearly the food supply has a lot to do with just how big or small any one grub might grow. Other variables like temperature, humidity, water, local nutrients and soil type will influence their size and development. Grubs live just under grass, usually 6 inches to a few feet down, all of which depends on their species, food supplies and the time of year. Since so many insects generate a grub like young which can live in turf, the purpose of this article is not to inform you of any one specific species. The author will, however, explain all you need to know about grubs in general and then offer control methods which are designed to control whatever type of grub you may have active on your property. Grubs usually go unnoticed until the results of their feeding is observed. Such results will include dead grass, plants and flowers. It is quite common to find them still feeding even as you are removing the dead plant, turf or flower!! Such "pockets" of grubs should be more then just an alarm alerting you to what is happening. Don't ignore it. 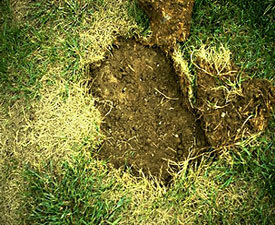 Grub damage is by far the most common type of damage sustained in turf grass throughout the United States. If you want to make sure you don't fall victim to a local infestation, get a pair of STRESS DETECTION GLASSES. These unique eye glasses allow you to "see" grass and other plants which are stressed out due to fungus, drought and parasites like grubs. Early detection will give you the upper hand when combating this pest. In other words, early detection allows for early treatments. Since the United States has such a large population of beetles along with a great selection of turf grass for them to eat, this pest won't be going away any time soon. Furthermore, the type of environments we like to create around our homes are just what helps to attract and keep satisfied any active grub population. In addition to grubs killing off plants, shrubs and grass, their presence tends to attract all kinds of animals. Moles, armadillo, badgers, birds, mice, rats, voles, shrews, gophers, groundhogs, muskrat, opossum, raccoon, prairie dogs, and skunk are just some of the animals which will readily tear up and pull apart lawns in an effort to find grubs. They love grubs and lawns which have active grub populations will undoubtedly start to experience animal digging and damage. If you already have this activity, you need to put an end to it as soon as possible. Turf which is in a weakened state already will quickly die off from all the digging. To prevent this from happening, spray some WHOLE CONTROL over the areas which are being attacked. This product is not a poison; instead it is a bad tasting agent that animals don't like. The goal here is to create a bad tasting soil so digging animals will have to go elsewhere to find food. Though not a true "control" program, spraying Whole Control can definitely help to relocate and force unwanted animals to find food elsewhere. Grub infestations can also lead to other insect problems. There are many types of wasps which actually feed on grubs. These parasitic wasps thrive in yards where grubs are present and will come to feed and nest when large grub populations are active. Such activity usually scares the homeowner into some course of action and our directions on how to deal with digger bees/wasps actually helps to control the grubs for a while. However, getting and keeping grubs under control is a never ending job and one which cannot be ignored. In fact, the author is quite convinced that the simple act of treating the yard for grub control 3-4 times a year can help to keep the yard and home free of just about any pest! That's right. The products and treatment schedule needed to get and keep grubs under control has a tremendous benefit in that this very treatment will stop roaches, ants, bees, wasps, termites and just about any type of common pest in and around the house from ever getting established. As our in depth article about Preventive Treatments around the home details, the act of using both a Granule and a Liquid material in the yard and alongside the home will help to keep just about all pests out. This means that if you are going to start treating your home for grubs, you will effectively be treating the home for all kinds of pests. This added benefit is just one more reason grub control should be done since it is one of the only types of pest control which has a large "all inclusive" type of effect.